Many divers won't even dive with a snorkel, just look around on the next dive you take at the beach or out on the charter boat, very few snorkels. You also hear many divers on those dives complain about their short bottom times and want to know how to increase it for more fun. A snorkel is part of that answer. The amount of air a diver wastes on the surface breathing from their regulator drastically reduces the amount of air for the actual time they are underwater. 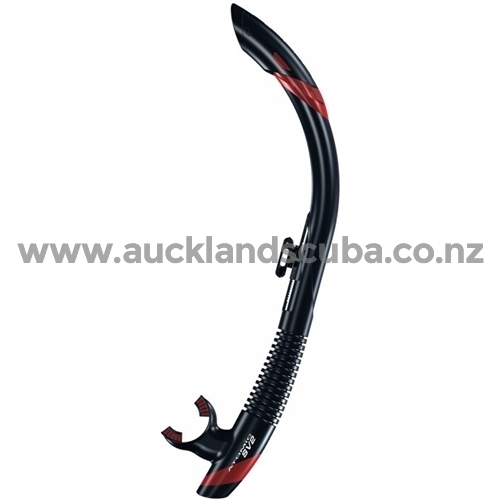 A Snorkel that is Easy to Clear is Low in Profile and one that stays Dryer inside is what you are looking for. SV stand for Scupper Valve, also known as a One-Way-Valve. Just like the One-Way-Valve in your Regulator which when you exhale drains water from your regulator the Scupper Valve basically works the same. The SV2 uses an additional feature that keeps water away from your mouth a Small Tube located just below the Mouthpiece is designed to keep the Breathing Airway path Free of Water Droplets. 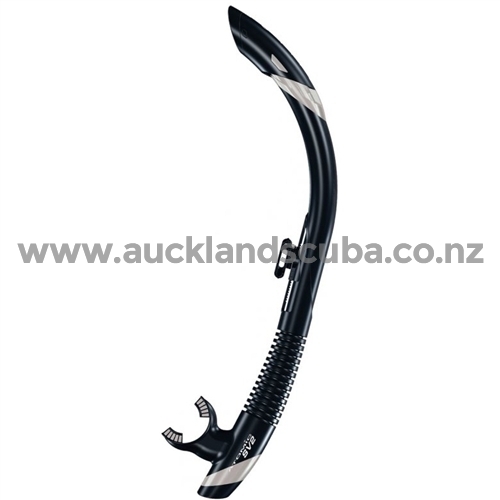 To keep water from easily entering the top of the snorkel the SV2 incorporates a Grill Grid Opening which Deflects Water that would go down the end of a conventional snorkel tube. The Flexible Lower Tube makes the Atomic SV2 Snorkel perfect for Scuba by Automatically-Swinging Out-of-the-Way when you are using your Scuba Regulator. So if you hate to use a snorkel, but want more bottom time this is the solution you are looking for. Snorkel comes with a Quick-Release Snorkel Keeper that has a 30° Rotation/Sliding Adjuster and has a Removable and Replaceable Silicone Mouthpiece. 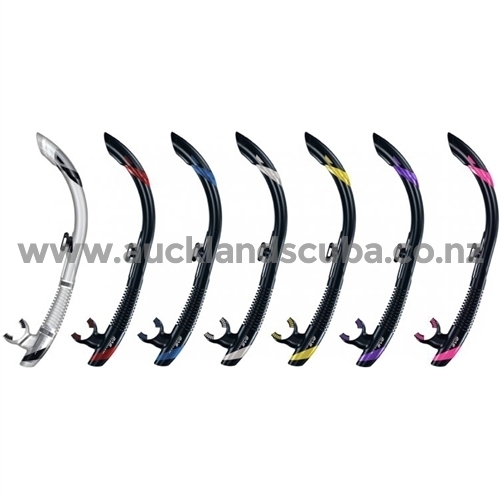 The Atomic SV2 Semi-Dry Snorkel is available in Multiple Color Choices and is covered by a Limited Lifetime Warranty.